Published: Jan. 3, 2014 at 10:23 a.m. Updated: Jan. 3, 2014 at 12:22 p.m.
Days after Jon Gruden pulled his name out of the NFL's coaching carousel, Bill Cowher is doing the same -- for now. "I've never closed the door," Cowher told "CBS This Morning" on Friday, per Pro Football Talk. "But it's highly unlikely any time in the near future you'll see me coach." Cowher's name came up this week when Redskins general manager Bruce Allen told reporters he hadn't contacted the former Pittsburgh Steelers coach as a potential replacement for the fired Mike Shanahan. "There's nothing to that. 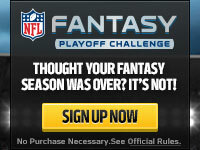 I was never contacted by the Washington Redskins," Cowher said Friday. Like Gruden, Cowher has traded in the grind and long hours of an NFL gig for television work. We wouldn't be shocked if he someday ditched CBS Sports for a (highly paid) return to the sideline, but this year's crop of coach-needy teams are out of luck. We previewed all four Wild Card games in the latest "Around The League Podcast."